The recent 'Victoria Cave Revisited' exhibition at the Folly in Settle inspired me to revisit the cave myself and seek out exactly where the great finds came from. The entrance you see here is completely artificial and was excavated during the 1870s. The accumulated 'spoil pile' can be seen on the left, above which is the original small entrance into the cave. This is, without doubt, the greatest archaeological cave ever discovered in the UK. The best way to reach it is to drive through Upper Settle, climb the steep minor road towards Scaleber Force and park in the layby close to a bridleway (SD835630). There is a signposted path to Attermire Scar and it's about a mile and a half to the cave entrance. 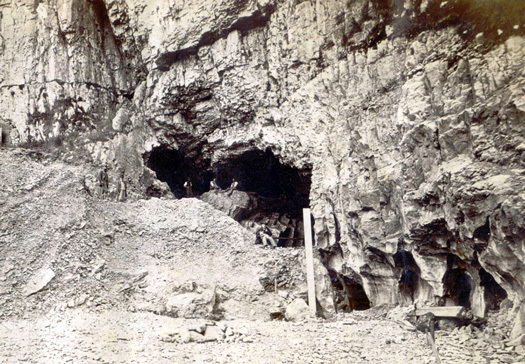 This is how the cave looked in the 1870s when the sediment floor of chamber D, on the right, was being dug out. The cave lies in a spectacular area of the Yorkshire Dales, to the east of the market town of Settle, and views like this abound. This shot is taken from the top of Attermire Scar, looking along the line of the Mid Craven Fault at Warrendale Knots - another of my favourite places. Walking along the valley bottom to the cave gives a view of the back of Warrendale Knots and the 'Two Towers' with the reef limestone knoll of Sugarloaf Hill and Pendle in the background - dominating the Craven lowlands. From this angle, it is easy to see that this was once a reef with the deeper waters of the Craven basin beyond. Brentscar Cave is soon seen up a scree slope on the right. Harry Speight refers to this cave (1892) as being 'near to a collection of stones known as the watch tower' and suggests it was used as a look-out in Romano British times. And finally the Queen herself emerges. Here the artificial entrance can be seen on the right, with the original entrance to the left. A sketchy path leads up the scree slope to the cave. The entrance itself is imposing and does look completely natural. Note the distinctive bedding plane in the Great Scar limestone above. The biggest danger today came from falling icicles! Michael Horner (1813-1878) was out rabbiting with his dogs in 1837 when one of them chased a fox into this hole - then much smaller than seen here and largely blocked by sediment. When the dog failed to return, Horner removed debris and small boulders and crawled inside. There, he found coins in the topsoil from the Romano British period. This is how Michael Horner appeared a few years later. I wonder if he had a son called Jack??? 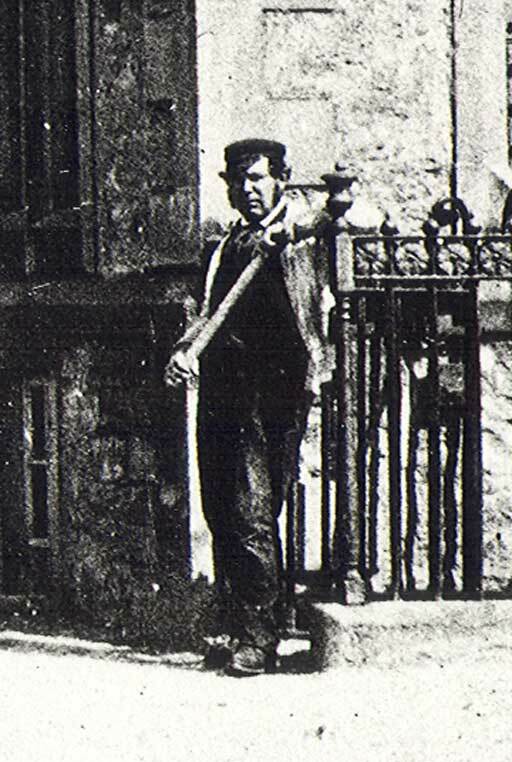 (couldn't resist that) At the time of the Cave's discovery he informed his boss, Joseph Jackson (1816 -1886) - who had a keen interest in archaeology. In June 1838, on the day of the Queen's coronation, Jackson crawled inside for the first time, naming the cave in honour of his monarch. He was the first person to extensively dig the cave, later setting up the Settle Cave Exploration Committee. The first full scale excavation took place in the 1870s when Jackson and William Boyd Dawkins uncovered many of the more spectacular finds. Tot Lord and the Pig Yard Club added to these in the 1930s. It is possible that this very boulder, by the entrance, was levered out of the way by Horner when he first crawled inside. It is a narrow crawl that makes its way to what is known as Chamber B, in the upper part of the cave. This chamber has been largely excavated, but in those days the sediment will have nearly filled it to the roof. This incredible Palaeolithic barbed point of reindeer antler, found in the scree outside the original entrance in 1874, has been carbon dated to about 10,800 BC. It was once thought to be a harpoon head, but this has been much debated. It indicates occupation by man as the climate warmed following the last glaciation. These icicles were formed over 12000 years later, but are still impressive. An even better view is from this angle, looking out of the main entrance. A view into the excavated main entrance. The original sediment floor was higher than the overhang in thecentre. Some real manpower has gone into this work. This is Chamber D, with Birkbeck's passage leading off through the slot in the centre, and chamber A leading off on the left. The first layer of sediment contained Romano-British coins and jewellery from some 1500-2000 years ago - the same layer that Horner himself discovered. Below this was an Iron Age layer from 1000 years earlier containing shards of pottery and decorated stones. This seems to indicate a period where the cave remained unoccupied. However, the next layer was some 12000 - 15000 years old, marking the closing stages of the last glaciation when animals began to seek out the recently thawed out and unblocked caves for hibernation. This brown bear's skull, found in chamber B in 1874, dates from that time. In this layer were bones of badger, wild horse, reindeer, pig, goat, sheep and both grizzly and brown bear. 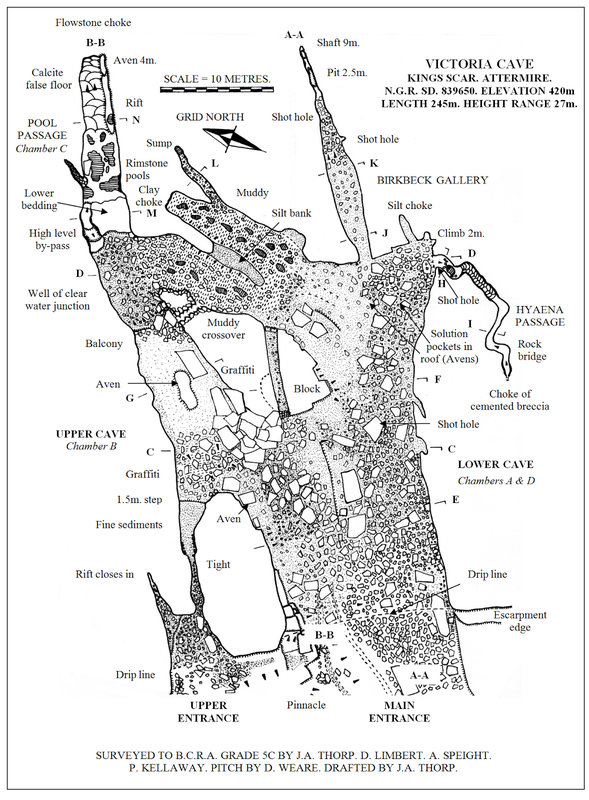 The survey of Victoria Cave. The Main Entrance has been completely excavated and Michael Horner's original entrance is the upper one on the left. The back of chamber D, where the bear's skull was discovered, lies among the boulders close to the entrance to the Birkbeck Gallery. This remarkable hole up on right at the back of chamber D marked the top of the next layer, known as the hyaena layer as it not only contained bones of spotted hyaena, but also those of many animals scavenged by the hyaenas or dragged into the cave to eat. It is also possible that the hyaenas fed on bears and other animals that had died in hibernation. The bones have been dated to 120,000 years, between glaciations when Britain lay near the equator in a warm climate. No matter how many times I think of this, it is still difficult to accept. This cave is something else. These icicles are dangling into what would have been the hyaena layer. The passage leading off through the hole, it is believed, may even have been used by the animals for breeding. It has been named 'hyaena passage' and should not be entered as the deposits on the floor are very delicate. A collection of objects from Victoria Cave. The Palaeolithic barbed antler point has been described earlier. There are also bevel-based rods of reindeer antler and bone needles. The rods originate from the back of chamber A, where wild horse vertebrae, dated at 12500 BC were also found. These had been fed upon by wolves and the bones still bear teeth marks! The bone perforated spoons, above left - the purpose of which still remains a mystery. They date from the Roman0-British period, 100 to 450 AD, and were found in 1870 in the upper layers of chamber B. Note the immense distance in time between the two sets of objects illustrated here! The entrance to the Birkbeck Gallery at the back of chamber D. It was completely blocked by sediment until dug out. There are still delicate deposits on the floor of the Birkbeck gallery. The upper cave can be reached by bearing left inside the entrance chamber. The most beautiful feature is the bridge of calcite between chambers B and C containing gour pools on its surface. To get a great view, you need to crawl underneath it and then look back over its upper surface. It is important never to touch such delicate formations. There's a glimpse of daylight from the main entrance and the calcite is very attractive. The pools forming on the surface of the bridge are exquisite, with calcite cascading like pearls - a petrified waterfall of real beauty. Another view of the calcite bridge between chambers B and C. An engraved javelin head radio-carbon dated to 10,900 BC was an important find here, indicating that man had reached this area at that time, as the Ice Age was drawing to an end. There is a golden effect on the calcite under certain lighting conditions. Let's have a final look! The ceiling is so beautiful, it appears to be naturally vaulted and resembles the dome of a cathedral. The calcite bridge from another angle, at the back of chamber B. It is believed that much still awaits to be discovered here. The back wall of chamber A, from which Mesolithic reindeer antler were discovered as well as cut-marked wild horse vertebrae dated at 12,500 BC proving that humans hunted wild horses around that time. The bones had been dragged into the caves by wolves. Chamber B was the first excavated by Joseph Jackson as it lies just inside the original entrance passage. This boulder slope plunges down to the calcite bridge area. The boulder slope viewed from another angle. The junction in the main entrance chamber, divided by boulders. Right leads to the back of chamber A, where the horse vertebrae were found, left is a short-cut to the upper cave, chambers B and C.
Snowy view out of the main entrance, showing the extensive spoil heap. Finally, on emerging, a view over Attermire to Rye Loaf Hill, dominated by millstone grit. Victoria Cave is a scheduled ancient monument and a site of special scientific interest. Its interior has been included here for educational purposes and to make a visit to the 'Victoria Cave Revisited' exhibition at the Museum of North Craven Life even more rewarding. Visitors are not encouraged to go beyond the barriers inside for safety reasons and to avoid disturbing the delicate deposits. It is hoped that this little tour will play its part in reducing the amount of erosion. Besides, you don't want to ruin your best clothes. That would never do. This is a fantastic tour of a remarkable cave and archaeological site. I will be using this site and material. most expertly pieced togther, in a lecture. The aim to demonstrate the complexity of depoists, the historical challenges that face us in how they were dug and the longlgevity of their usage. Well done this is brilliant. Makes me want to vist and in the winter. Unfortunately I'm in Cornwall!! Another awesome tour, I really am falling in love with this place. You have a real knack of being able to take your readers to the places you visit through both your photos and writing. Love the humour too. Now I just want to visit these places!